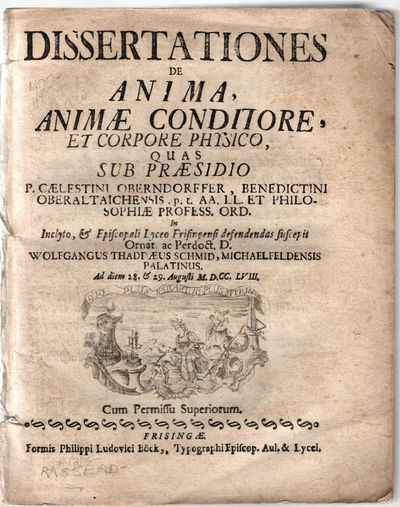 Dissertationes de anima, animae conditore, et corpore physico. Frisingae: Formis Philippi Ludovici Bock, . 4to (20 cm, 8"). ff., 83, , 184 pp.,  ff., 9 fold.plates. A compiled publication of six dissertations under Oberndoffers direction in the fields of medicine and physics: De anima; De anima conditore deo; De corpore, ejusque affectionibus mechanicis; De motu corporum; De principiis mechanices, statices, & hydrostatices; and De rebus aerometricis.